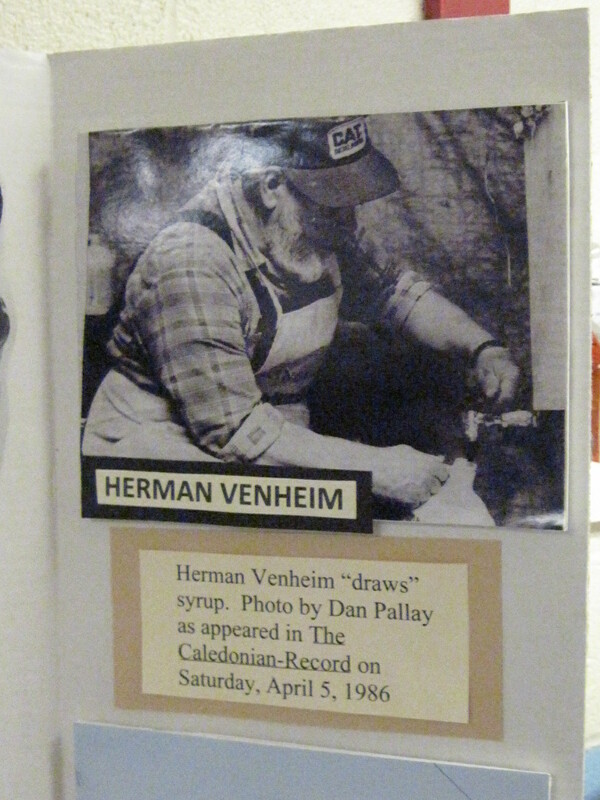 The late Herman Vennheim, sugaring in Lunenburg. This weekend, my friend and neighbor Susan McVetty and I headed over to the Maple Festival in nearby Lunenburg, Vermont. We each had a homemade pie in hand, baked that morning to enter into the maple pie contest, just one of the many events and exhibits in play. 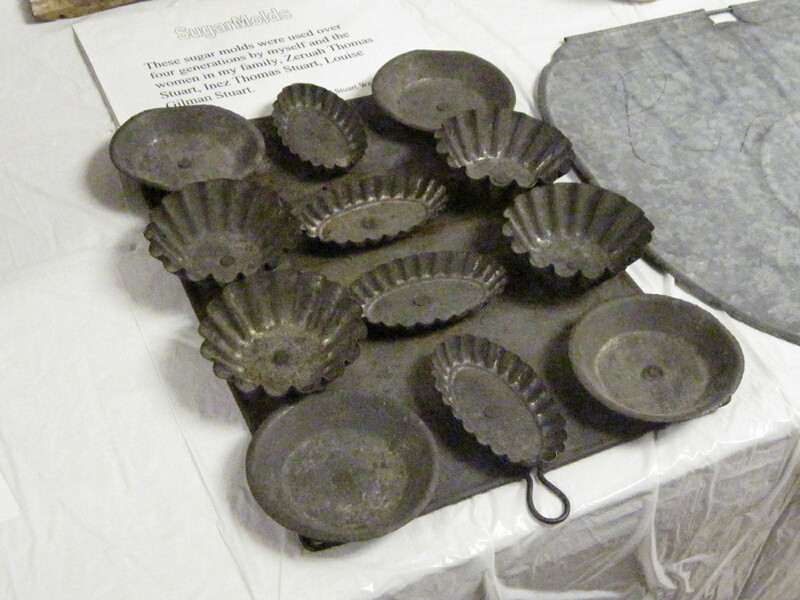 The Festival was held at and around the Lunenburg Primary School and included detailed exhibits on the history of maple sugaring in Essex County–with vintage photographs of sugar houses and family sugar teams at work, displays of antique sugaring equipment, and a plethora of information about the local maple sugar industry. In the cafeteria, there was a delicious-smelling pancake and egg breakfast served by town and school officials and students. After dropping off our pies (mine was actually a tart! ), we walked out to the Lunenburg town common, which is still covered in over a foot of snow. 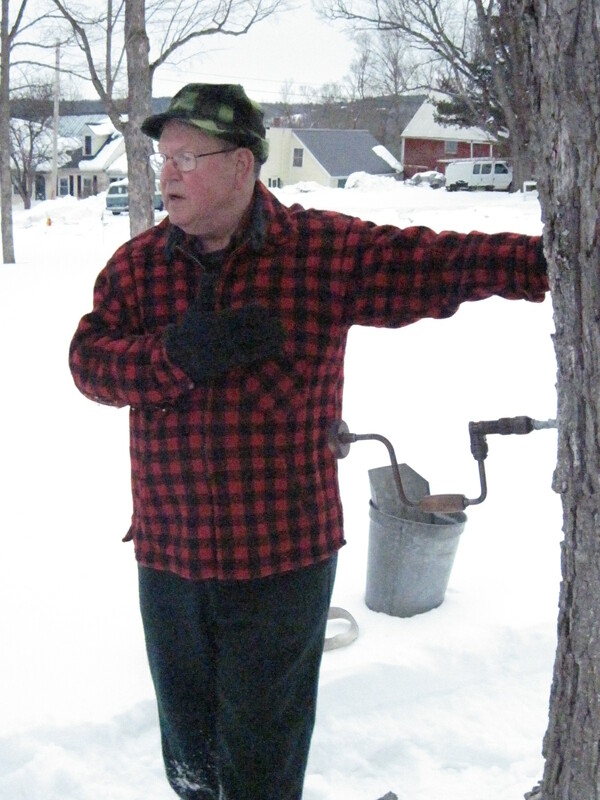 There, local forester Mac Dowling (pictured here) gave a brief presentation and demo on maple trees and how they are tapped. 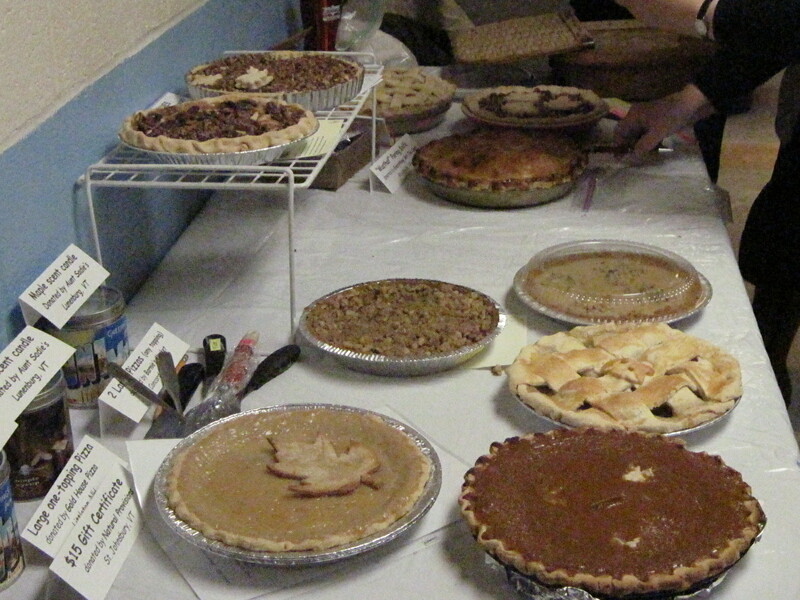 Back at the school, the judges tasted and looked at all the pies. There were three categories in competition: maple cream/custard, maple nut, and maple with fruit of some kind. In the end, the top overall vote-getter was a very appealing looking sweet potato-pecan maple pie. (I will have to try this!) And then Susan won in the maple cream category for her Black Pepper Maple Cream Pie. I had made a Maple Nut Tart, which did not place–but I still love entering pie contests, even when I don’t win. LaBounty’s Sugar Shack, on Pond Hill Rd. We then set out to one of the local Sugar Houses, LaBounty’s, on Pond Hill Rd. 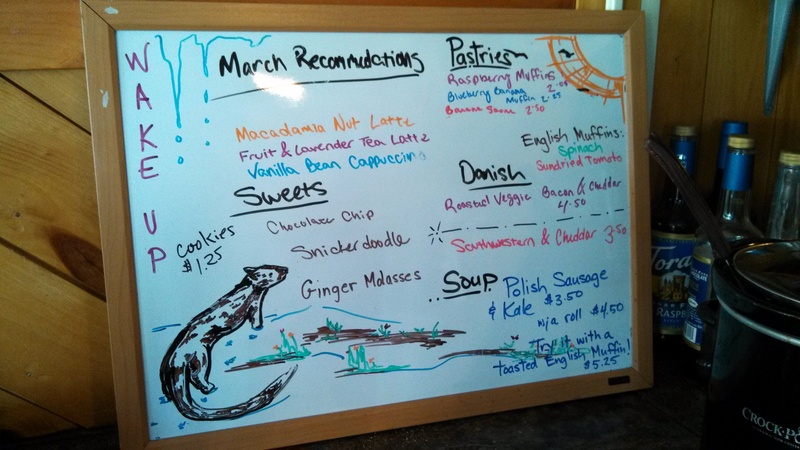 As part of the Maple Festival, approximately 10 local maple producers had agreed in theory to hold open house, but as it happened, only 3 were actually open. 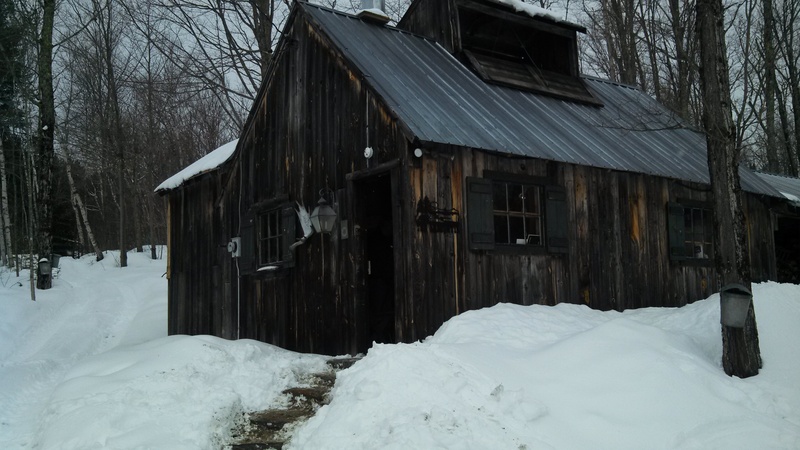 In fact, it hasn’t been the greatest year for maple sugaring in these parts, primarily because of our subzero temperatures extending into March. It’s a struggle for agricultural producers to make it in this part of Vermont, where the market is not as robust as other regions. In part, that’s why the USDA has recently specifically targeted local maple producers and given some substantial grants as part of the new Northeast Kingdom REAP (Rural Energy for America Program). Learn more about these fantastic grants here! As some of my readers will recall, I’ve posted here previously about a fabulous new non-profit business here in Guildhall, known as Stable Connections. Founded, owned and managed by Karen Guile, Stable Connections is an equine therapy facility devoted to meeting the needs of developmentally disabled and otherwise at-risk youth and adults. For more detailed information about Stable Connections, see my past blog post on the facility, here. 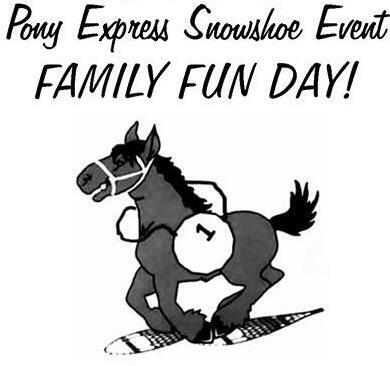 Today’s event involved a snowshoe race for kids on groomed trails along the Connecticut River, tours of the stables, prizes, crafts, and refreshments. By the time I got there, the race had already occurred. Kids and adults were milling about amicably, cavorting, talking to the horses, making bracelets and drinking hot cocoa or eating steaming hot bowls of chili. In the winter, it’s fairly rare in these parts to have any kind of social or group events, so it was pleasant to mingle and catch up with some neighbors. And standing around the Stables, there was even a spirited and interesting discussion about the new Common Core curriculum in our local schools–with several parents, a School Board member, our local elementary school principal, and the assistant principal from the Whitefield, NH elementary school chiming in. I love it when substantive conversations like this occur in unlikely places! 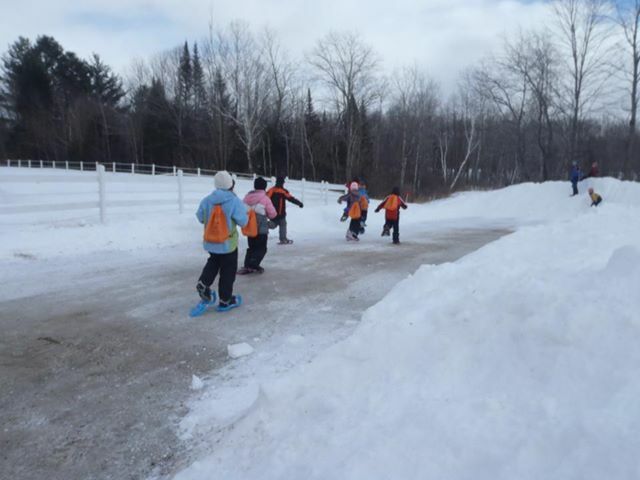 Karen Guile, announcing prizes to snowshoe kids. Most important, I’m grateful when people like Karen Guile and small business in general give back and contribute to the community, by, for example, organizing events like this. Stable Connections sits on a parcel of land originally owned by Peaslee’s Vermont Potatoes. Karen is also the chief financial officer and manager of Peaslee’s. It’s gratifying to note that over the past two years, under new management, the Farm has made a concerted effort to reach out to the community, from donating to the local food pantry, to programs for at-risk youth (at the Farm and at Stable Connections), and today’s community-spirited event. 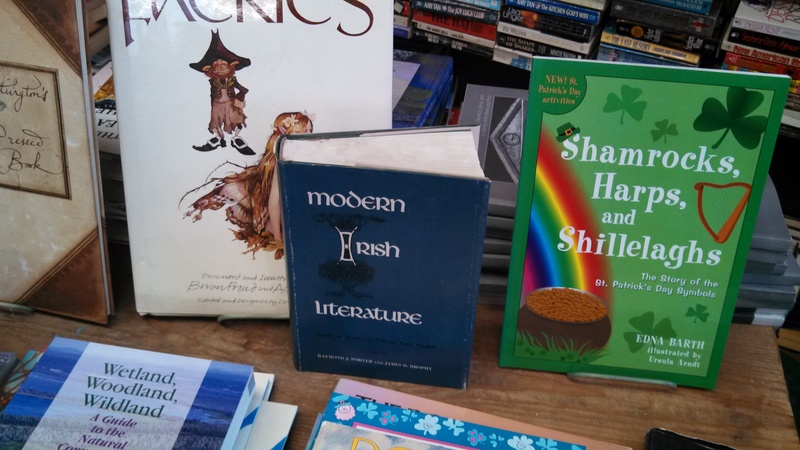 I begin this post of things Irish with this image and a link to a remarkable Op Ed piece from this morning’s New York Times entitled “Paul Ryan’s Irish Amnesia,” written by Timothy Egan. Read this important and timely article here, which explores the hypocrisy of Paul Ryan in connection with his ancestral links to the brutal poverty of the Irish famine. 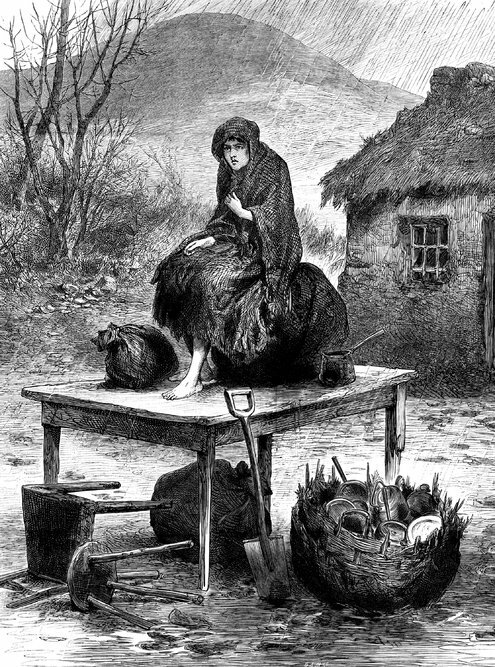 During the potato famine of the 19th century, British lawmakers and policy makers characterized the suffering Irish as undeserving and unworthy of assistance. Today, in a United States increasingly marked by low wage work, lack of health insurance, and outright debilitating poverty, Paul Ryan takes a similar position toward less fortunate than himself. (I consider Paul Ryan and his ilk to be a shame and blight on their party). 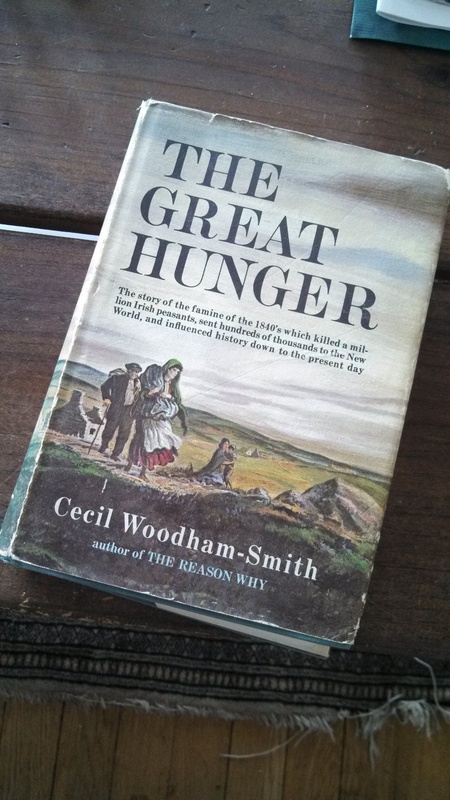 Here is the cover to the book cited repeatedly in this important article, “The Great Hunger,” by Cecil Woodham-Smith. 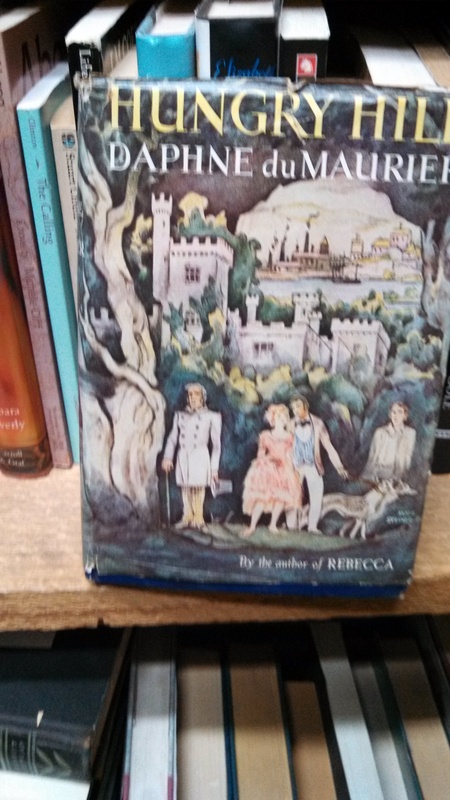 We own this book and I have read it many times. I consider it required reading for anyone seeking to understand the political economy of Ireland in the 19th century. 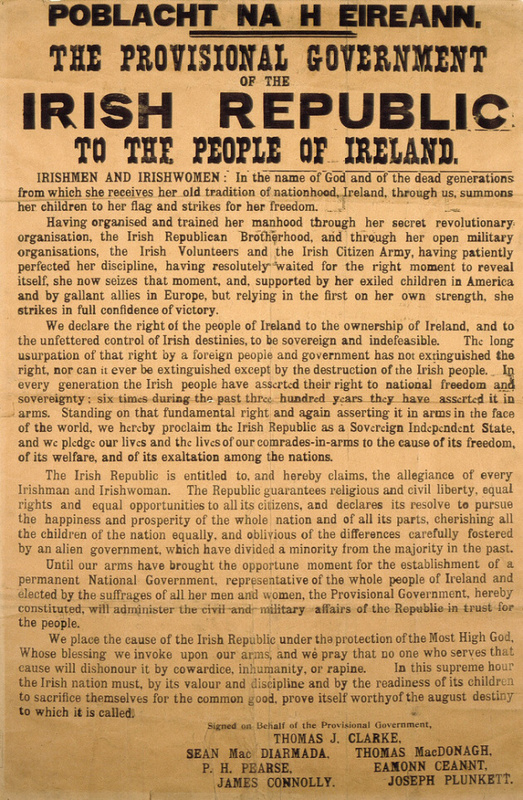 “On Easter Monday, 24 April 1916, at a time when Ireland was an integral part of the United Kingdom of Great Britain and Ireland, seven Irishmaen proclaimed the establishment of the Irish Republic, nominating themselves as its provisional government. Together with 1,600 poorly armed followers, they occupied a number of prominent buildings near the centre of Dublin, the General Post Office in Sackville Street (now O’Connell Street) being designated as headquarters. The government of Great Britain and Ireland regarded the insurrection as treason, all the more so as it came in a critical phase of the war then being waged with Germany and her allies. The response was immediate and decisive, the outcome being a foregone conclusion: by the following Sunday close to 2,000 people–mostly civilians–had been killed or injured, the General Post Office and various other buildings were in ruins, and the insurgents had surrendered. The seven signatories of the Proclamation and eight others were tried by courts-martial and executed by firing squad. A sixteenth man, Roger Casement, was tried in open court in London and hanged in Pentonville Prison. Read more about the history of the Easter Uprising at the National Library of Ireland’s website. And here is the quintessential Irish rebel tune, one that never fails to give me the shivers. By the Wolfe Tones. 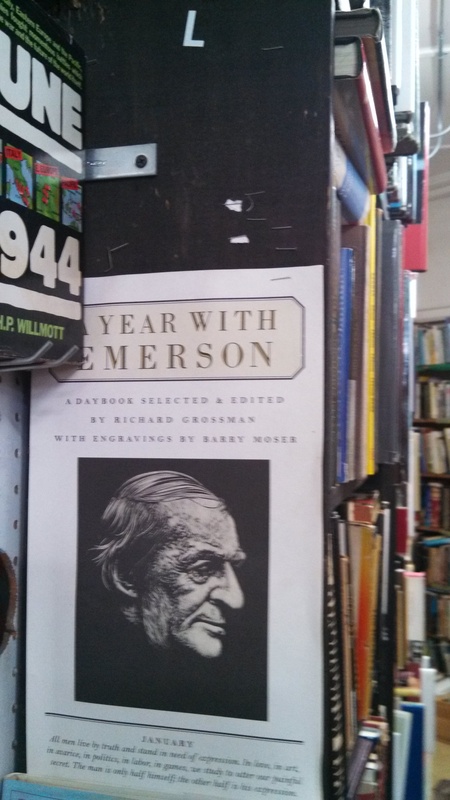 An Hour at Green Mountain Books. 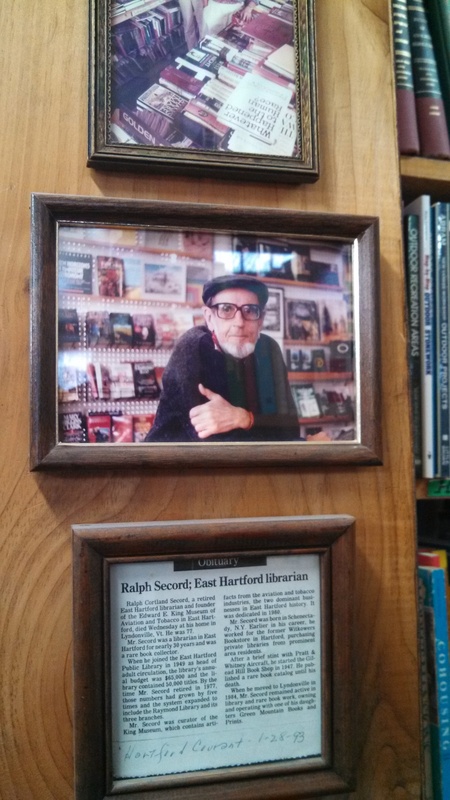 The Storefront of Green Mountain Books, Lyndonville, VT.
Ralph Secord, original owner and proprietor of Green Mtn Books. 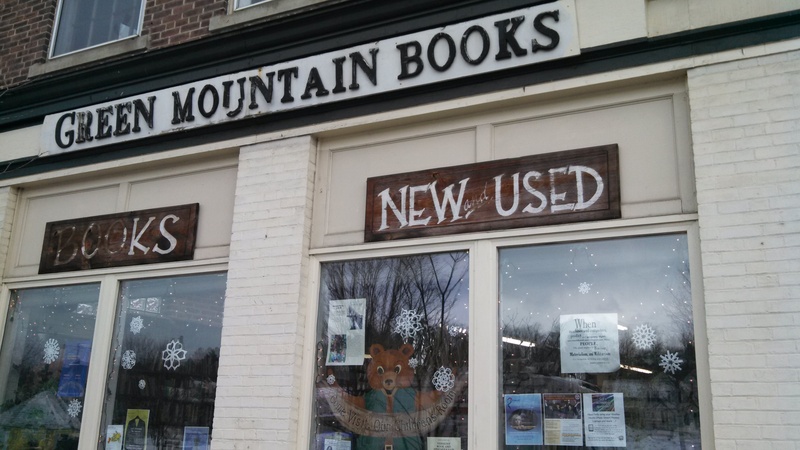 Green Mountain Books has been in business for a whopping 38 years. 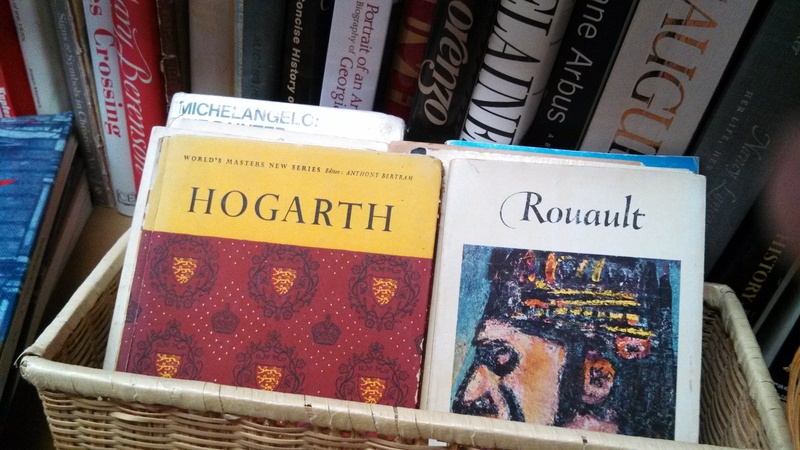 It was originally opened on a part-time, summer basis by the legendary Ralph Secord, a librarian and literary aficionado from Hartford, Vermont. 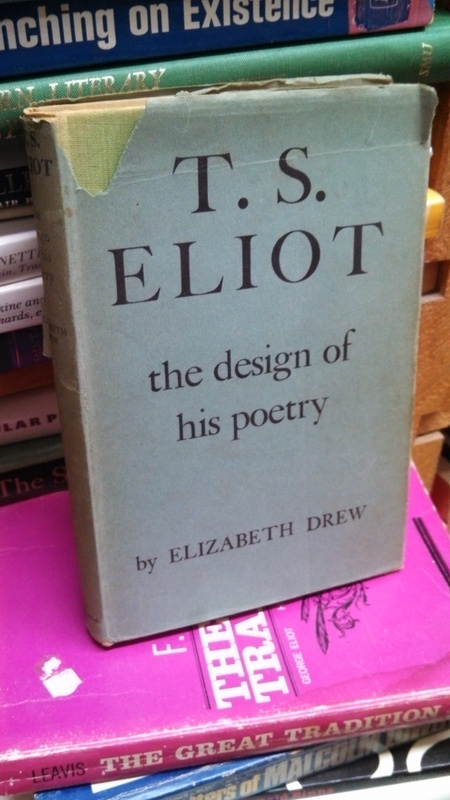 Ownership and management then passed to his daughter Ellen Secord-Doyle. And finally, Ms. Doyle sold the store to its current owner, Kim Crady-Smith. You can read more about the bookstore’s history, here. On a slushy gray day earlier this week, I stopped in to the store to take a break from some thorny legal dilemma or another, and was, as usual, cheered by the store’s atmosphere. I spent about an hour exploring fascinating nooks and crannies, identifying little treasures here and there. Here’s a little annotated photo essay of some things I found. Here is the cozy reading chair by the window. It’s near the section on homesteading. 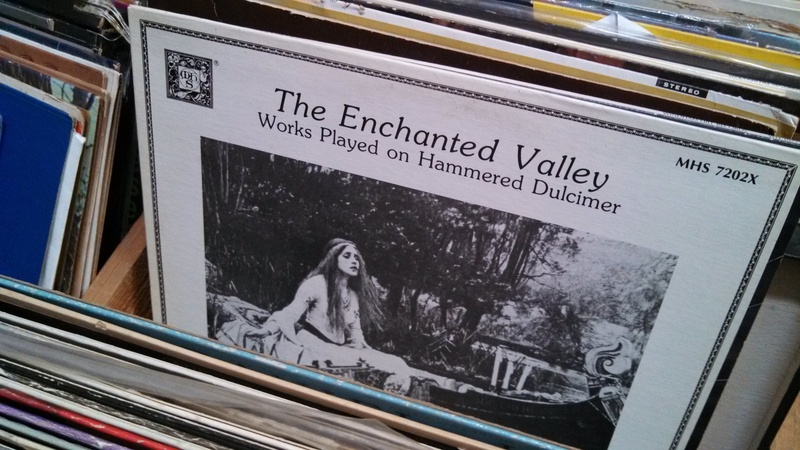 The store also has a little music section tucked into one corner, where one finds old vinyl albums and some obscure and fascinating sheet music. 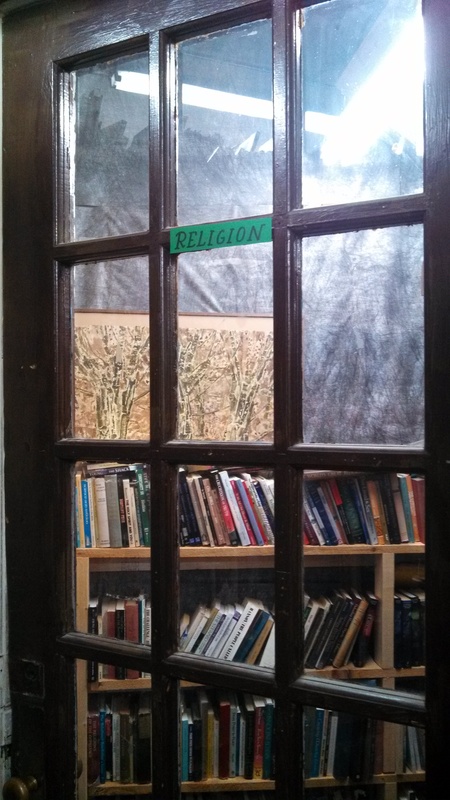 I’ve always loved the fact that the “religion” section is located in a closet with the door closed. It’s accessible (all you have to do is open the door to get in), and you can even see the books through the glass, but it’s sort of private and segregated from the rest of the books. That’s how I think religion should be (if you’re so inclined): not imposed on anyone, a place you must choose to go, privately. 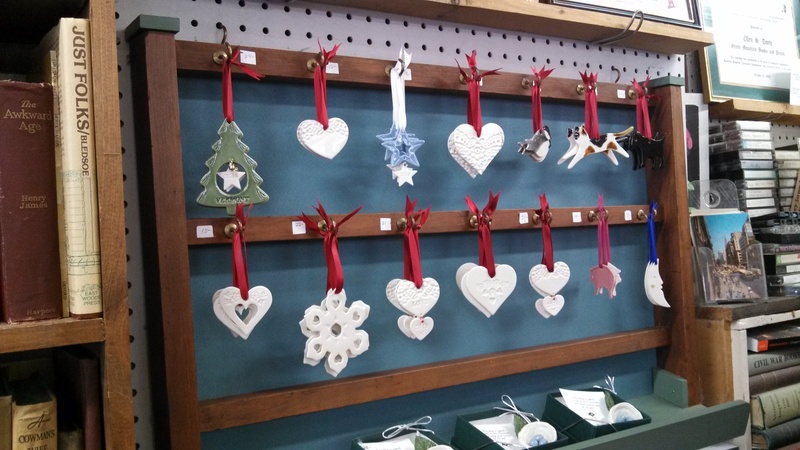 Here’s the display of ceramic Christmas decorations. I love the artwork and literary posters gracing the walls. 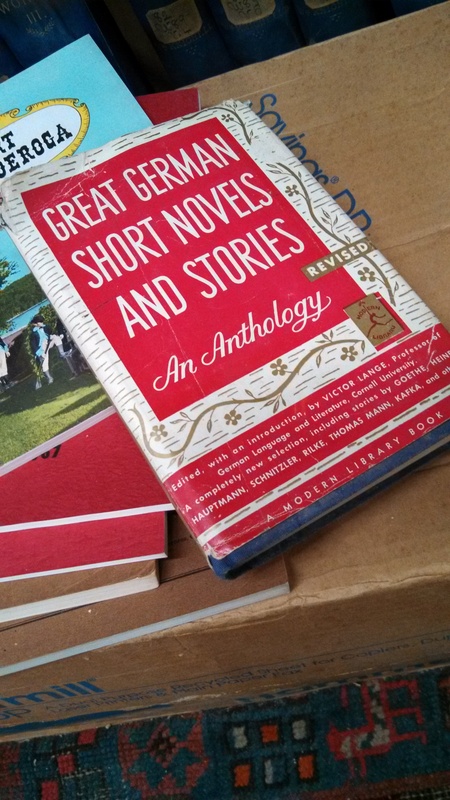 Here are some samples of the little gems I found throughout…. 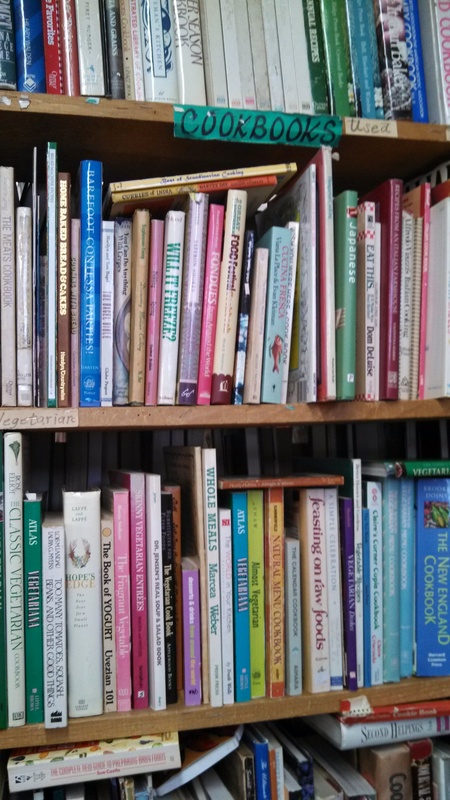 The cookbook and baking section. A New Partnership: Morrissette, Young & Wilson, PC. As many of you know, as of January 1, 2014, I have joined forces with Morrissette & Young, of Lyndonville, a firm with a long and distinguished history of practicing law throughout the Northeast Kingdom. We are all three partners now, and the new firm is called Morrissette, Young & Wilson, PC. 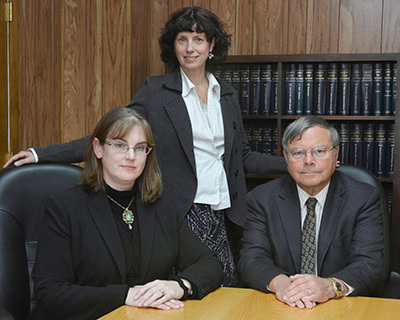 The new firm has three lawyers and two offices, located in Lyndonville, and in Guildhall, Essex County. Check out the firm’s new website, here! We offer a broad range of legal services, including real estate transactions, family law, criminal defense, municipal law, estate planning, business formation, general civil litigation, and landlord-tenant law (among others!) I’m excited about this new endeavor! 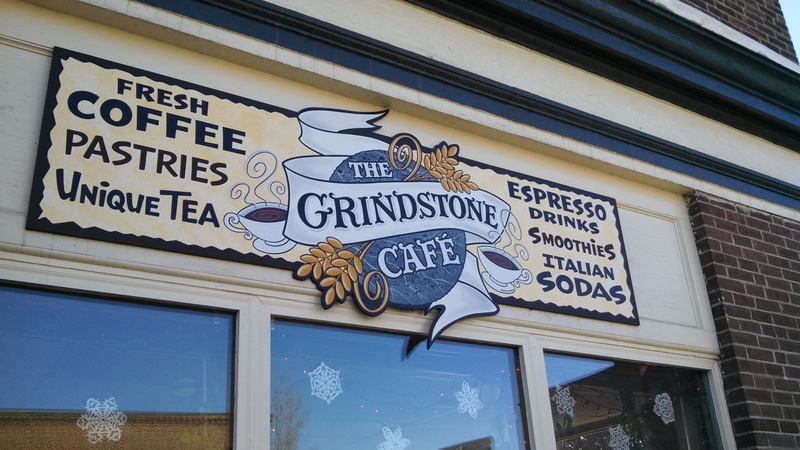 Around the corner from my law office in the heart of downtown Lyndonville is the marvelous, cozy and funky Grindstone Cafe. I’ve lived in Essex County, a hyper-rural part of the Northeast Kingdom for about 9 years now. I think it’s a fair representation to say there isn’t a single cafe in the whole of the county. There are a couple of roadside variety stores which double as gas pumping stations (both on Rt 2, one in Concord, one in Lunenburg). There’s a greasy spoon breakfast and lunch joint on Rt 2 in Concord. 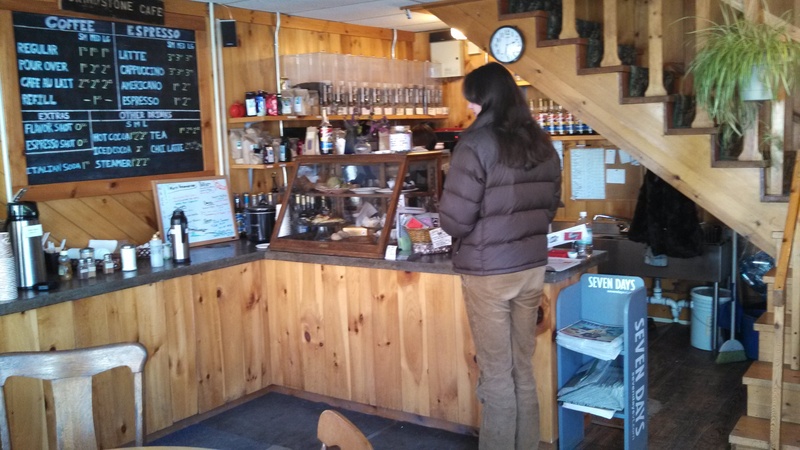 Up in Island Pond, there’s a sandwich deli and a bar with a small greasy spoon restaurant attached. And I haven’t been to Canaan (right on the Canadian border) recently, but I’m pretty sure that’s nothing there at all. In any event, there’s certainly no establishment where you can go in, sit down, whip out your laptop, and drink a latte or a cappuccino, munch on scones and muffins, see local artwork on the walls, and even take a yoga or tai chi class if you’re so inclined. 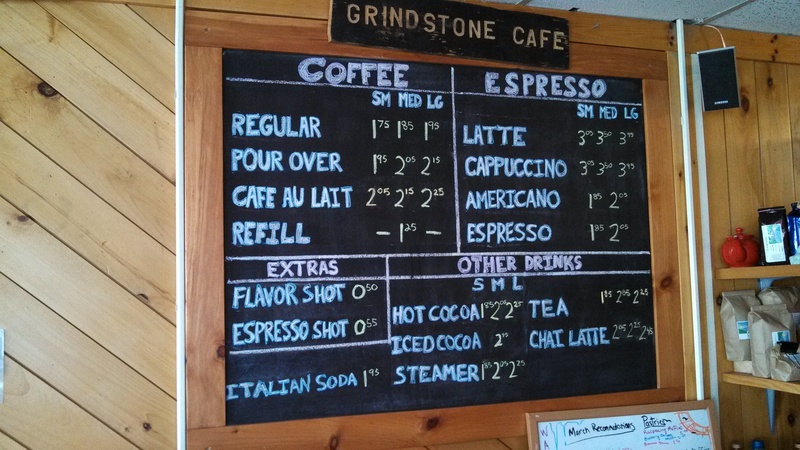 That’s the Grindstone Cafe, but you have to go to neighboring Caledonia County, in the town of Lyndonville for it. I’m very lucky indeed to have this little grass-roots establishment just around the corner from my office. The Grindstone is a relatively new endeavor in Town. It started in March of 2011 and has since changed ownership, with a focus on doing its part to build and strengthen a vibrant, safe, fun and interesting downtown Lyndonville. 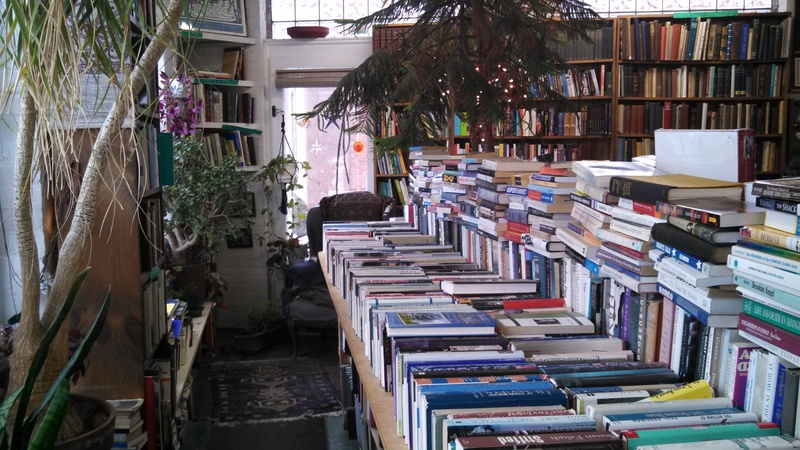 The Cafe’s owners are themselves well-integrated into the local community–Kim Crady-Smith, one of the four co-owners, also owns and manages Green Mountain Books & Prints around the corner, arguably one of the best used bookstores in Vermont. All the fabulous baked goods at the Grindstone are baked locally, every day by Kate Colleran, who used to bake for and manage the wonderful Crumbs, a bakery/cafe that closed back in 2010. On any given day at the Grindstone, you’ll enter to find a wide range of people gathered for coffee, conversation, or newspaper reading. There are retired people, young stay-at-home moms with their kids, high school and college kids, and working people like myself. But the Grindstone isn’t just a place for food and drink. The owners are constantly drumming up a roster of activities and events. You can take a yoga or tai chi class in the afternoon or evening in the upstairs part of the building. There’s local artwork on the walls for sale, including photography, woodcuts and painting. A few weeks ago, a live band played the Grindstone, small as the venue is. They had a “beat” party with poetry readings some time back, a Valentine’s Day coffee and chocolate tasting, a Mother’s Day Tea Party, and a couple of years ago, the renowned poet Galway Kinnell came to the Grindstone to read his poetry out loud. Visit the Grindstone’s Facebook page to learn more. And stop by to visit this fabulous, cozy little corner of our Northeast Kingdom. You won’t regret it! 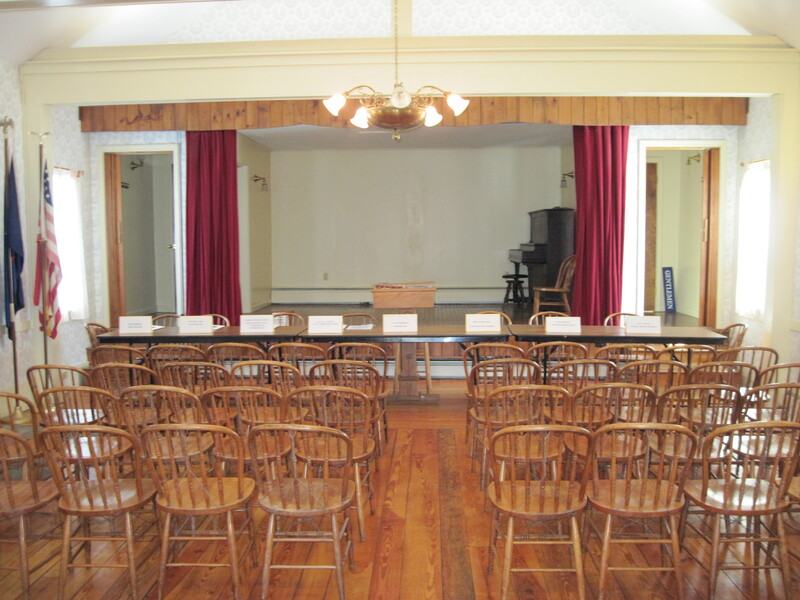 This year’s Town Meeting was, for the most part, uneventful and quiet. Turnout was low. Most people who did attend were on good behavior. The School District and municipal budgets passed without controversy or much comment. One encouraging fact is that our roads budget is down substantially from previous years, due largely to the efforts of our most recent Road Commissioner Tim Cahill, who I think deserves enormous credit. Most of the questions on our Warning were the standard ones, which sailed through rapidly. There were two exceptions, questions that generated at least some discussion. First, Article 2 proposed that the Town collect its property taxes twice a year rather than the single yearly deadline (October 15) we now have. On the single deadline system, the Town always has cash flow issues starting around May and sometimes earlier, depending on the size of the surplus from the previous year. Collecting another round of taxes in June would alleviate the cash flow problem and would minimize, if not eliminate the need for borrowing. Currently, the Town ends up paying anywhere from $400 to $600 in interest to our tax-anticipation lender. On the other hand, adding another cycle of tax bills to the mix would add costs for postage, paper and office assistant wages. (And create more work for Sam Swope, our current Treasurer and Valerie Foy, our current delinquent tax collector) It more or less comes out as a wash. Given that there didn’t seem to be any overwhelming taxpayer sentiment for paying taxes twice a year, we voted to keep things the way they are. Next up involving any debate at all was Article #13, which proposed that our tiny town with its tiny budget ($218,000 this year), appropriate $11,000 this year for a professional audit of the books and then more money in future years for a regular schedule of such professional audits. In short, the auditors found nothing concerning this year. From personal experience (I was the town treasurer for a period of six years, ending in 2012), I know very well that our auditors are hard-working, detail-oriented and super-competent. Ironically, as auditor Roger Brisson pointed out during the meeting when he rose to speak, our local elected auditors do a more thorough job than a Certified Public Accountant would do, because a typical CPA review audit involves only a random sampling (usually 15-20%) of all transactions/entries. In contrast, our elected auditors review every single disbursement, every warrant, every invoice, every bank statement, every reconciliation, and every deposit ticket. I’ve sat with our auditors hour after hour as they pore through the books, painstakingly reviewing every single item. They do this work quietly, invisible to most people in town, and they do it for almost no pay. That’s not to say a professional audit is never necessary. If the auditors identify some big, unresolvable problems or possible malfeasance, they alert us. That’s what happened, for example, for the fiscal year 2006 books. When the elected auditors were preparing their report, they found so many inconsistencies and discrepancies that they were not comfortable signing off with the usual “all is well” language. Instead, they wrote in the Town Report that they recommended a professional audit. We had the audit, to the tune of $6,000. Having professional audits on an “as-needed” basis is the way to go for a town of our size and budget. Regular professional audits, without a good reason, are just too expensive. In the end, the Article was soundly defeated, which wasn’t surprising, since no petitioner or citizen spoke in defense of it in any specific way, or put forth any good reason for it. We thanked our moderator George Blakeslee (who did his usual fabulous job), adjourned the meeting, and went home.